Bike theft is a crime of opportunity. Thieves are looking for the low-hanging fruit, especially the bikes that are left unlocked or locked inadequately. Not all bike locks are created equal — tougher is better. U-locks and heavy-duty chain locks are harder to cut and offer better protection. A cable lock is not secure enough to be your primary or only lock — they’re comparatively easy to cut with easily concealed tools, which is why bikes locked with cable locks get stolen so often. 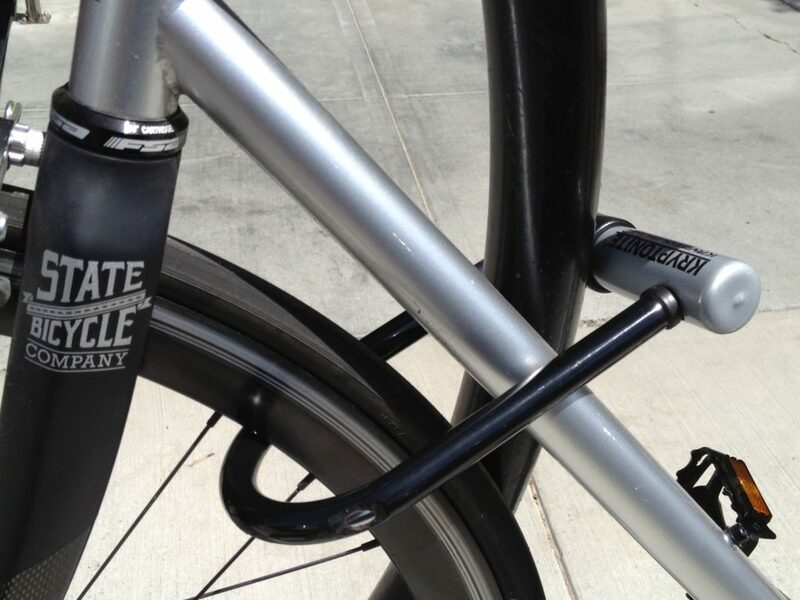 However, you can use a cable lock to secure a wheel or seat to your U-lock. And yes, U-locks and heavy-duty chains cost more than cable locks. But when you compare the extra cost to the cost and headaches of replacing a stolen bike, spending on a solid lock is a smart investment. PRO TIP: Some lock manufacturers offer low-cost anti-theft insurance to help you replace a stolen bike. Look for it when you’re planning to buy a lock. Your bike is most secure when the frame is locked directly to a solid stationary object, like a bike rack or tall metal post. You further improve your security when you can also loop your lock through one or both of your wheels. Locking only to your wheel or any other part that can be removed easily (basket, rack, seat) leaves the rest of your bike vulnerable. 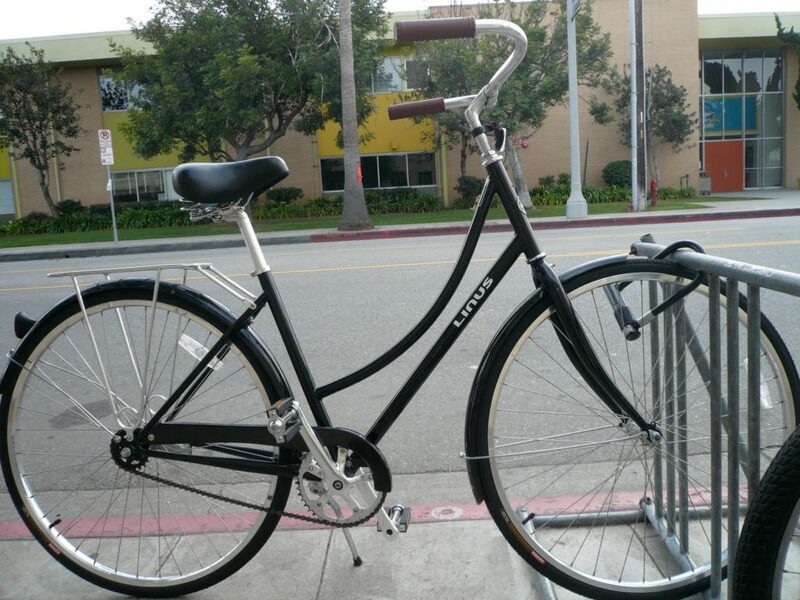 PRO TIP: Make your bike less attractive to thieves by taking a quick-release wheel or seat with you when you lock up. 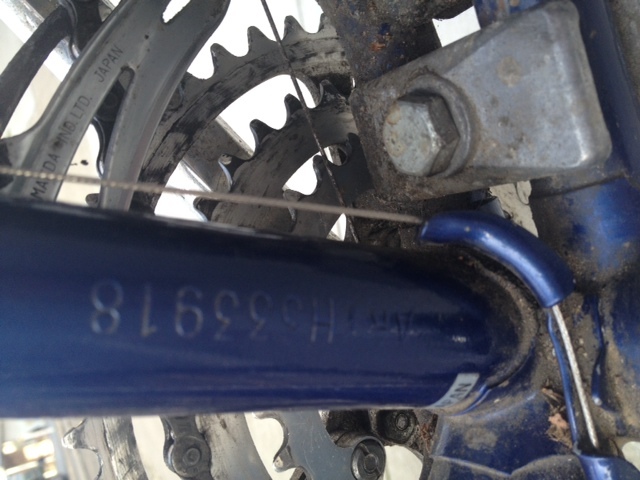 Also, ask at your bike shop about replacing quick releases with tamper-proof bolts. Visibility is the key to security. 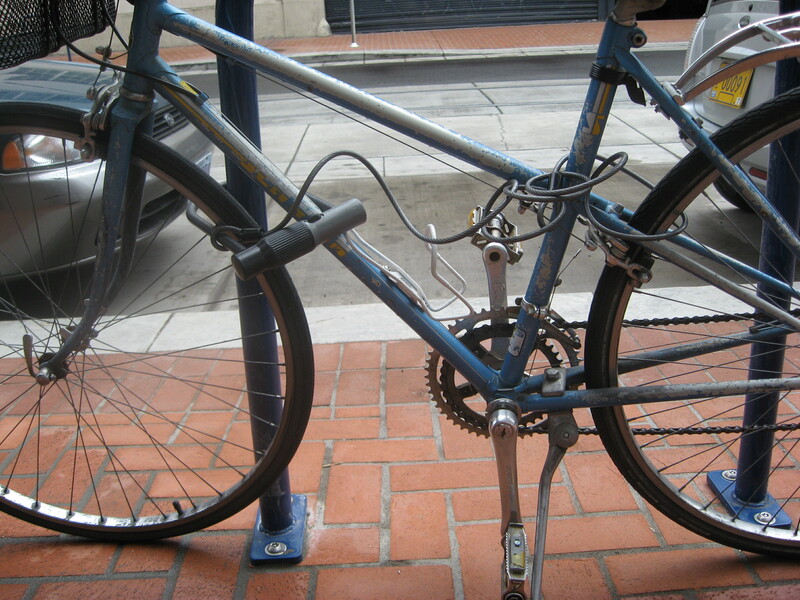 Locking your bike in a visible, central location, such as right near a busy building entrance, puts more eyes on your bike, which discourages all but the boldest thieves. At night, that spot should be well-lit, too. If you’re lucky, there’s a bike rack where you want to leave your bike. If there isn’t one — or it’s not visible and central — you’re better off locking to a tall sign post or metal fencing in a visible and central location. You’ll want to avoid locking to anything that can be easily cut, broken, dismantled or carried away, such as shrubs or chain-link fencing. And keep handrails clear for pedestrians with limited mobility. 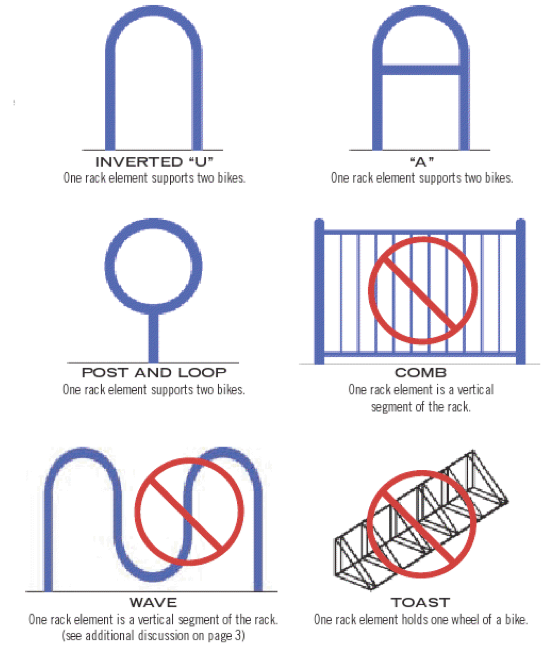 Choose the right bike rack, too. 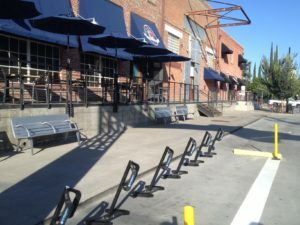 Not all bike rack styles offer enough security. The most secure styles — the inverted U, A and post and loop styles, as well as the Stanford rack (designed at Stanford University) — let you to lock securely to your frame. (Sacramento-based company Ground Control Systems manufactures a variant of the Stanford rack called a ‘bike dock’ used for City of Sacramento bike corrals and in campus settings.) 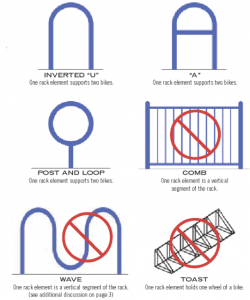 All these styles offer two points of contact for your frame, which keeps your bike stable. Even though you can lock your frame to a wave rack, this style of rack doesn’t provide much stability and it’s hard to park in the interior spots when the end spots are in use. And wave racks are often installed incorrectly in ways that make them harder to use. 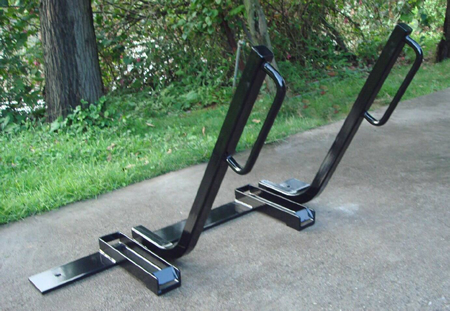 If you have to use one, position your bike parallel to the length of the rack, for stability, and lock to your frame. 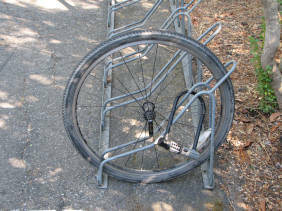 The old-school comb and toast styles (also sometimes called “wheel-benders”) are designed for locking your wheel only, which is never secure — avoid these racks! But if one of these is absolutely your only parking option, park across the end of it and lock to your frame. 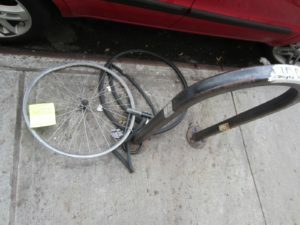 WARNING: Bikes left out overnight on the street usually disappear or get dismantled, even if locked correctly with a strong lock to a secure rack. 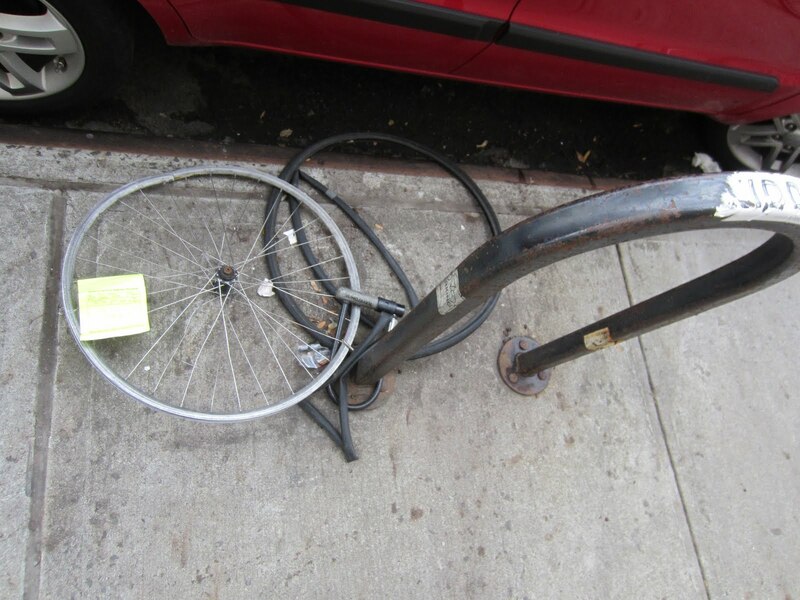 There’s no way to adequately secure your bike overnight on the street, no matter which neighborhood you park in! PRO TIP: If there isn’t adequate bike parking at your workplace or a routine destination such as the grocery store, ask your employer or the manager or owner to install a bike rack or upgrade what’s there. Be prepared to show them what you mean — if they don’t ride a bike, they may need to be educated. In these classic videos, a New Yorker tells it like it is about the right and wrong ways to lock a bike: Hal Grades Your Bike Locking, Hal (and Kerri) Grade Your Bike Locking and Hal Grades Your Bike Locking 3: The Final Warning! Unlocked bikes are the easiest ones to steal. 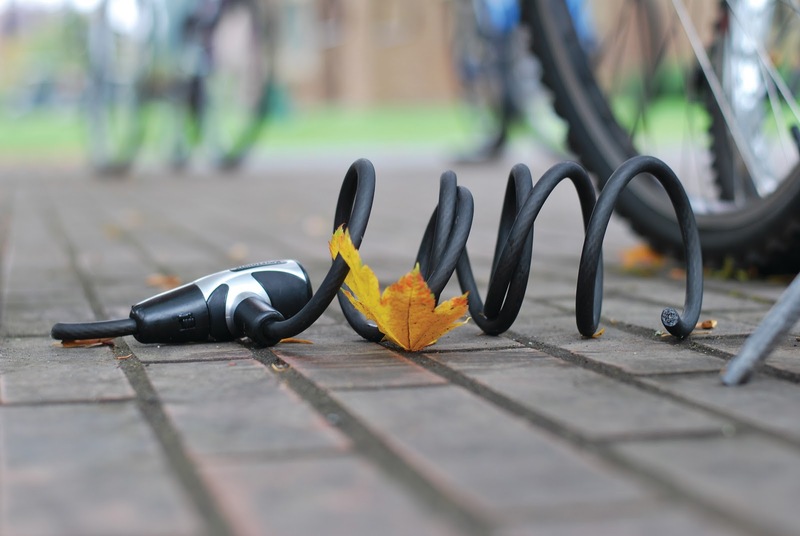 Even where it might seem safe to leave your bike unlocked for just a moment — for a really quick errand or to run over to say hi to a friend — that’s all the time it takes for someone to grab your bike and go. Locking needs to be a habit wherever you leave your bike unattended, even at home in a garage, on a porch or in the backyard (many of the bikes stolen from garages and backyards were left there unlocked). And don’t forget about locking up at a workplace that has any kind of public access. PRO TIP: Store your lock on your bike or in the bag you routinely carry when you ride. That way you’re always ready to lock up. Law enforcement generally won’t look for a stolen bike, but they routinely discover stolen bikes in the course of their other work. When they do, they often look for the bike’s serial number – that’s how they’d find you if they recovered your stolen bike. That’s why documenting your serial number is important. Residents of Sacramento County can register bikes online at Ride On!, the Sacramento Police Department’s new free online bike registry. Or simply “self-register” your bike: write down the serial number, make, model and color of your bike, and list any other identifying features (type of handlebars, brakes, saddle, racks, etc.) — these are the details required for a theft report. Store all this information, including sales receipts (if you have them), in a secure place you know you can get to quickly and easily. Download this self-registration form (PDF). PRO TIP: Keep a photo of your registration information on your mobile phone. Even if you don’t think it’ll do any good, file a police report. Few stolen bikes are actually reported stolen, and when they’re found, law enforcement has no way to identify the owners of most of them. As a result, only a small percentage of recovered bikes ever get returned — that’s why making a theft report is key for getting your bike back. Having a theft report can also help you file a claim against your homeowners or renters insurance, in case your bike is stolen from your home. Finally, reporting a theft helps give law enforcement, public officials and property owners the most accurate picture of where thefts occur in the community. This can aid in prevention and enforcement efforts. PRO TIP: Use social media ASAP to spread the word about your stolen bike. Include a photo if you have one.